A spinach-artichoke dip is an old favorite that’s perfect for accompanying chips or bread. Real Simple provided a recipe that starts with chopping 10 ounces of spinach and 12 ounces of artichoke hearts. Combine the vegetables with cream cheese, sour cream, cheddar, salt and pepper in a bowl. Transfer the mixture to a baking dish and place in an oven set to 400 degrees Fahrenheit. Bake for about 15 minutes, checking for the dip to cook through and turn golden. Serve with lemon wedges. Chili con queso is another much-beloved dipping option and a cornerstone of Tex-Mex cuisine. Bon Appetit suggested a version that’s packed with delicious ingredients, beginning with preparing a picadillo. Start by browning ground beef in vegetable oil, leaving the fat behind when you move the meat into a bowl. Add onion, bell pepper and garlic to the pan, cooking over a medium heat for eight minutes. Throw in salt, pepper, cumin and chili powder and cook another minute before returning the beef to the skillet with a cup of chicken stock. Simmer for eight to 10 minutes, sprinkling some more salt and pepper. Set the picadillo aside in a bowl, and cook garlic, onion, poblano and jalapenos in butter over a medium heat until they become tender. Add tomato and salt, cooking another six minutes. Stir in flour, followed by milk. When the mixture starts to boil and thicken, lower the heat and throw in grated cheddar and Monterey Jack. Stir as the cheese melts. Place the picadillo at the bottom of a baking dish, cover with the queso and then top off the dip with pico de gallo, guacamole, sour cream, chives and cilantro. 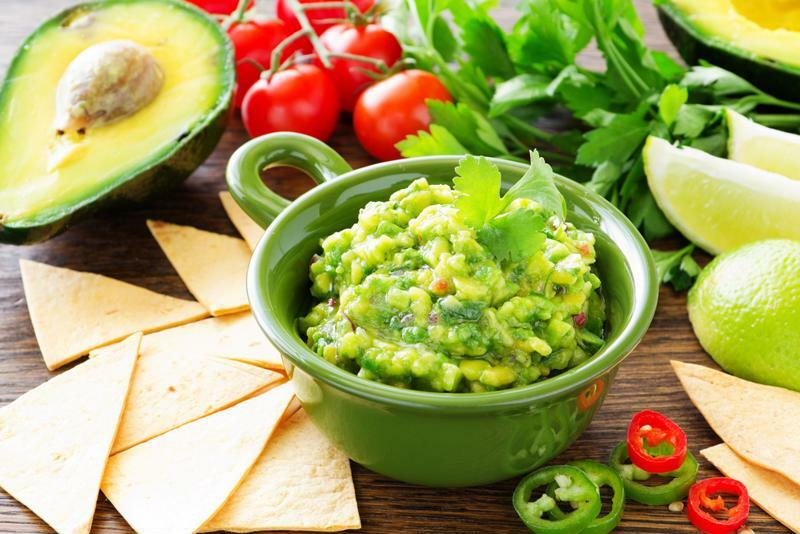 You can’t go wrong with an old-school guacamole. Nevertheless, if you’re interested in bringing a salty, savory variation to the table, Food & Wine has you covered. Cook eight ounces of bacon, and dice a couple chipotle peppers. Mash two ripe avocados with a fork, and then stir in crumbled pieces of bacon, the chipotle, cilantro, lime juice and salt. Once you’ve made these dips, try experimenting with some different tastes and ingredients. Your guests will be happy to test them all out for you.